Huawei have been making a bit of a splash (sorry!) with their smartphones of late. With a combination of solid design, good build quality and reasonable price tags their phones are getting the attention they deserve. 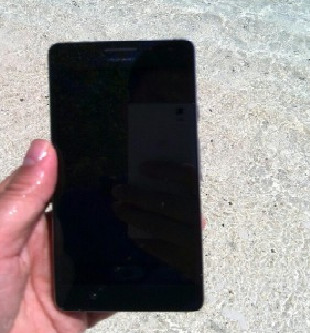 With that in mind the upcoming Ascend P2, pictured above, has been caught showing off the waterproof certification which it is set to receive! As well as being waterproof we expect the device to offer a 4.7-inch 1080p display, a quad-core processor clocked at 1.8GHz. The rumour mill currently believes that we'll see 2GB of RAM, 8 and 16GB options, a 3000 mAh battery and 13 megapixel rear shooter. Hopefully MWC can reveal some more! That $24.4 billion deal to make Dell private again may well have hit a snag. Southeastern Asset Management disagree with the agreed buying price of $13.65 per share, instead they feel that something more like $24 per share would make them happy! We're not sure how this will turn out, but things could get nasty! Minecraft and the Raspberry Pi, what do they have in common? Arguably not that much, but that doesn't matter because one can run the other. That's exactly what we're seeing here: you can now get your Minecraft fix on your Raspberry Pi! Check here for full details! O2 UK have launched a new service called O2 Tracks! The service offer you unlimited streaming access to the UK Top 40 singles chart. That privilege will cost you £1 a week if you’re an O2 customer, if not then you can have it for £5 a month, which isn't too much more expensive really! Check out the O2 Tracks site here for more and to download the app for Android and iOS, Windows Phone and Blackberry versions are in the works! Apparently UK retailer, Debenhams and more specifically their free WiFi service have been a huge hit! The service launched in June last year with O2's help and since then husbands and boyfriends have spent an average of 30 minutes browsing on their mobiles while their other halves hunt around the aisles! The top five most popular websites on the service are, in descending order: Facebook, Sky Sports, LiveScore, BBC Sport and YouTube! LG has hired ex-Samsung employee, Carolyn Anderson, as the new head of mobile communications marketing. She was 'head of channel marketing and partnerships' at Samsung and is again re-united with Andrew Coughlin, who is LG's head of mobile communications! Hopefully the pair can bring some of Samsung's recent success to the company too! As one comes in another goes out, this time Dr. Lee Jeung-Jil has left LG display to head to Cupertino and Apple. The man himself is an expert in OLED technology, so we can expect him to help Apple as they work to bring OLED screens to their mobile and possibly even their computing devices. And finally, what could possibly be a better way to wrap up today's news than with a short video of Sony's new Xperia Z taking 999 pictures in 68 seconds! We're not going to lie, this is quite impressive, but it would be interesting to see how long other phones take to do the same thing?